Pat C Got Enuf now known as NUFFI was adopted by Janet and Harvey in Mason. 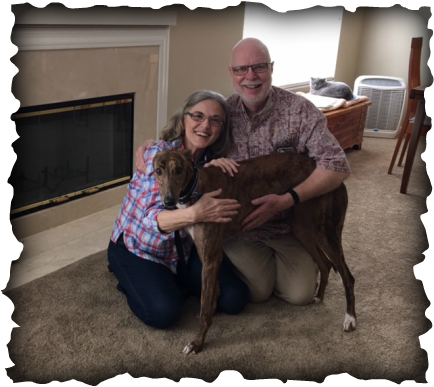 This family has been stalking us at every local M & G for over 6 months, they had travel plans and had to wait for a kitchen remodel before adopting a greyhound. Well the wait was well worth it, Nuffi will be a perfect addition to their family with their 4 cats, Poki, Kalima, Eddie and Dougall. We're thrilled they are part of our GAGC family finally.